The traditional way to celebrate Veterans Day involves parades and speeches and solemn ceremonies to commemorate those who have served honorably in the U.S. military and to mark the signing of the armistice that ended World War I. But nowhere does it say you can't spend the Thursday prior to the holiday laughing yourself silly. In fact, we recommend you do, at an event by veterans with proceeds benefiting veterans -- that is, us. 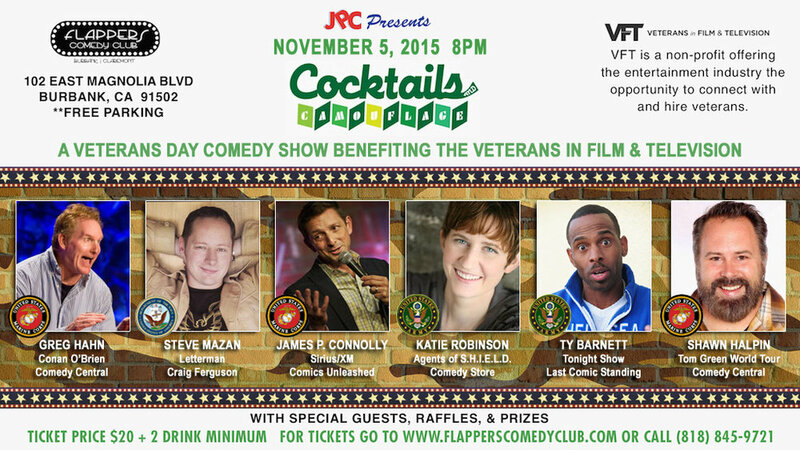 On Nov. 5, VFT member and Marine Corps veteran James P. Connolly presents the 6th Annual Veteran’s Day benefit comedy show “Cocktails & Camouflage." The event will raise funds to support our work connecting veterans with opportunities in the film and television industry. The event is open to the public -- you don't have to be a veteran to enjoy the military-grade comedy. Connolly, who has appeared on Sirius/XM Radio and Comics Unleashed, hosts. “I’ve loved doing this event for the last six years," he said. "It’s a way to bring together two of the biggest pieces of my life, Comedy and the Marines, to help veterans causes." Army veteran Ty Barnett ("Last Comic Standing," "The Tonight Show with Jay Leno," "Star Search"). Plus, Connolly promises us there will be special guests. Last year, Kristy Swanson stopped by -- the original Buffy of vampire-slaying fame. Just saying. The show begins at 8 p.m. at Flappers Comedy Club, 102 E. Magnolia Blvd., in downtown Burbank. Tickets are $20 each, which includes dinner and entry for a chance to win door prizes. There’s a two-drink minimum, but as always in beautiful downtown Burbank, parking is free. Order tickets online here or by calling (818) 845-9721. If you can’t attend but would like to sponsor the event or treat a veteran to a free ticket, you can donate via a secure PayPal account on the event’s website at www.jamespconnollypresents.com.